A 'shocked and disgusted' wife has blasted Job Centre officials who ordered her husband to attend an interview - despite the fact he cannot walk, talk or feed himself. Nick Gaskin, 46, was diagnosed with primary progressive multiple sclerosis 16 years ago and communicates by blinking. 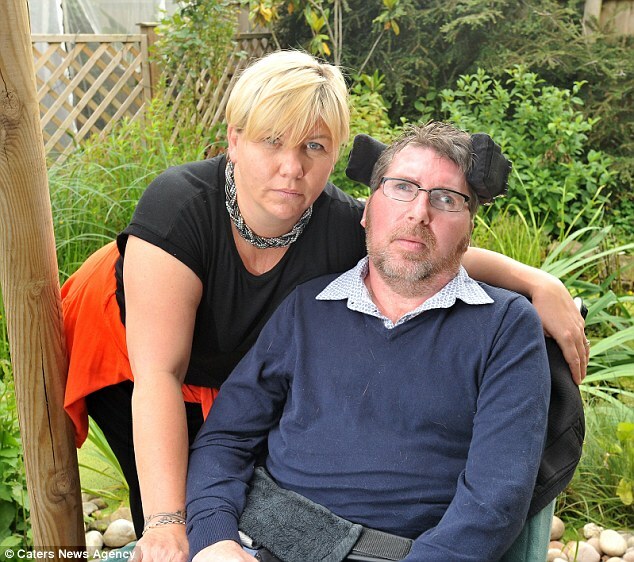 Nick, from Quorn, Leicestershire, is unable to do anything from himself and requires round-the-clock care from wife Tracy, 41. But Tracy was stunned to receive a letter from the Loughborough Job Centre on Wednesday of last week telling Nick he needed to attend a 'work-focused interview for Employment and Support Allowance'. Tracy followed up the letter with a phone call to the Department of Work and Pensions, but the phone operator told her Nick would lose his benefits if he did not attend. She said: 'It's ludicrous and stupid; what exactly do they expect him to do? 'He cannot walk, talk or eat on his own, to arrange an interview like this is just a complete waste of time. 'What people don't realise is what comes along with disability is depression and anxiety. 'When I called the number on the letter the person said if we couldn't get to the centre perhaps there could be a telephone interview. Mrs Gaskin said her husband, who has been in receipt of disability allowance for 16 years, is a 'very proud man' who is desperate to be able to get out of his chair and provide for his family. She said: 'Unfortunately MS has stripped him of that. 'In the end we laugh about him learning new skills but the very serious side is letters like this going to people, especially the elderly who don't have support around them. A spokesperson at the Department for Work and Pensions said Mr Gaskin was sent the wrong letter and they have apologised for the error. She said: 'It looks to us, after we investigated, that Mr Gaskin was sent the wrong letter. 'We understand that Mr Gaskin can't communicate with us and the right letter should have been sent to his wife. 'What it should say is if you would like to get in touch the option is open, but it is not compulsory in any way.